I had a lot of fun painting this during the recent all night 24 hour charity broadcast with Gonzo from More Than Dice Podcast! 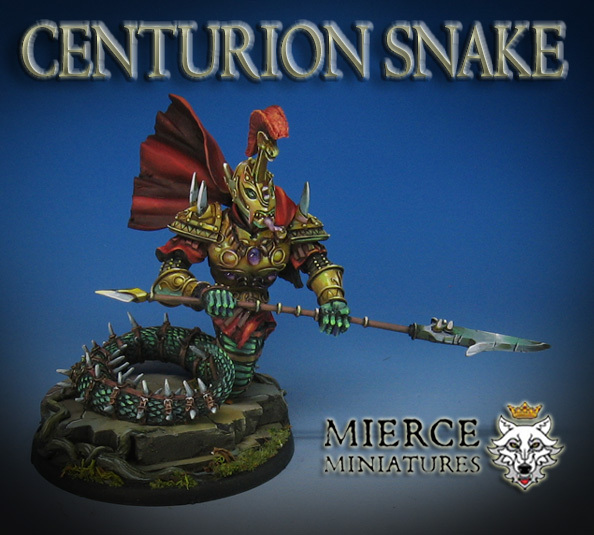 It's another monstrous infantry from Mierce Miniatures, one of a number of "Snakemen" poses. Of late I have been emphasizing how simple my approach to Non-Metallic metals is. The majority of the colors I choose for them (if it is gold, steel, etc.) are what is surrounding the metal surfaces. In this case, a fair amount of greens, purples and reds. All of these colors form contrasts with each other, which helps to make the metals look more shiny. When you have lots of colors reflected in those metals, such as the skin, stone base and even the cloak, the eye becomes more convinced that it is seeing something like metal due to the reflectivity. This is why my response to the question of purchasing "NMM paint sets" is always to use the colors you already have on your palette! Something else to keep in mind is that the color harmony works in reverse too. I used a fair amount of yellow to highlight the reds in the cloak and crest, and even to lighten the green scales! This means that the "gold" color was not just isolated to the metal sections... it is everywhere else, even on the base. Since this is becoming a major topic of discussion in my posts and on my Facebook/YouTube live sessions, I will try to create some new NMM tutorials in addition to the original Painting Pyramid versions. A few of those are already available to my patrons on the Patreon Page!